Protect your wrists from resin and scratches with these cuffed arm covers. 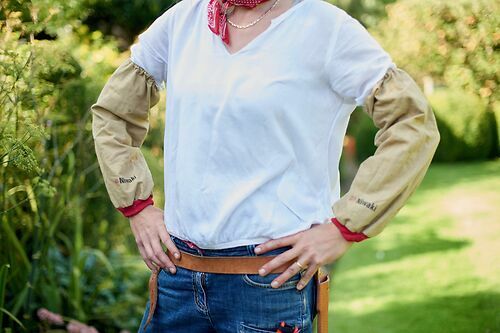 Cotton arm covers worn by all Japanese gardeners, particularly when pine pruning. Protects your wrists and shirt sleeves from pine resin and spiky needles. Elastic end (top) and ribbed cuff (wrist end). If you're a real cheapskate, a pair of old socks with a hole cut in the end does the same job!